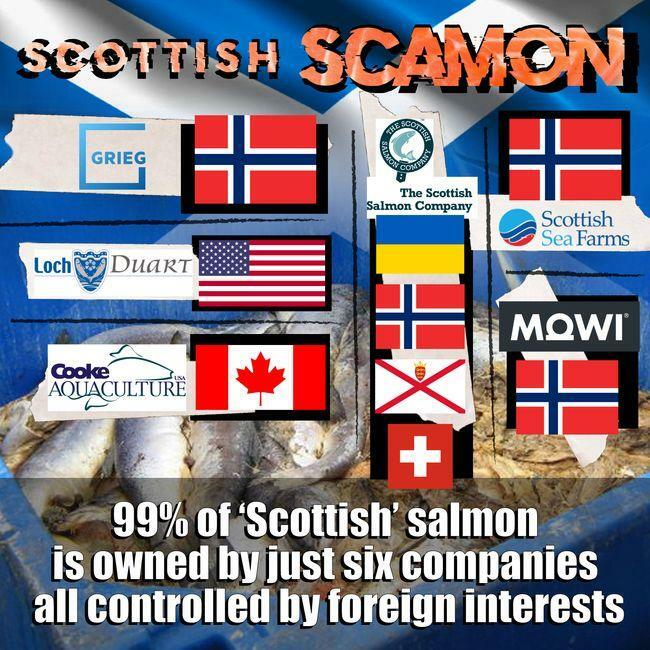 A new report - Scottish Scamon: How foreign interests control 99% of 'Scottish' salmon farming - lifts the lid on how investors in Norway, Canada, Switzerland, Cyprus, Luxembourg, United States, Monaco and Ukraine have hijacked Scotland's iconic fish. "Scottish salmon is made in Norway, registered in offshore tax havens like Jersey and owned by investors in Switzerland, Luxembourg, Cyprus, Belgium, Canada, Monaco, Ukraine, the United States and Norway," said Don Staniford, Director of Scottish Salmon Watch. "So-called 'Scottish' salmon is a sham, scam and a consumer con. A staggering 99% of salmon farming production in Scotland is controlled by the foreign-owned companies Mowi (formerly called Marine Harvest), The Scottish Salmon Company, Scottish Sea Farms, Grieg Seafood, Cooke Aquaculture and Loch Duart. Foreign interests are abusing Scotland's pristine image and flying the flag of convenience as a vehicle to flog cheap and nasty Scottish salmon." 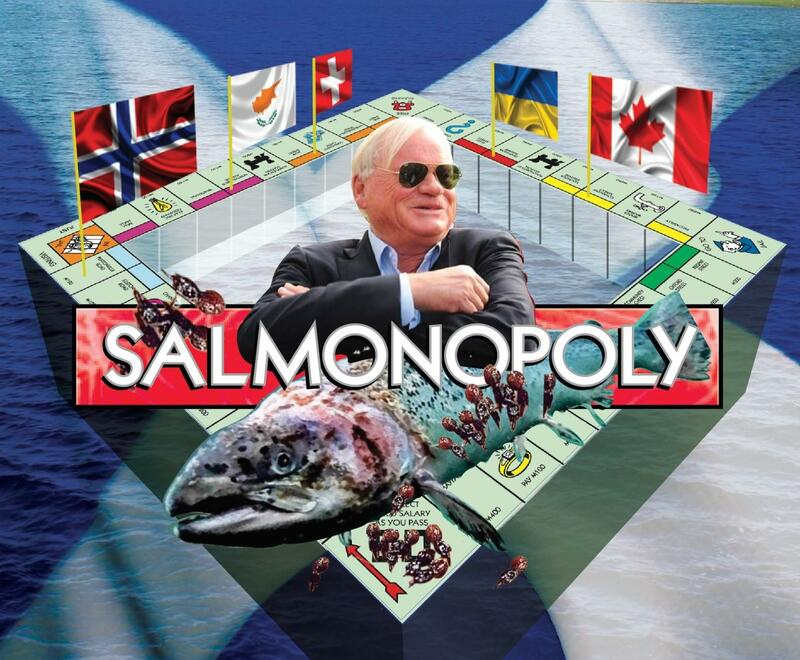 "Shoppers are being duped into buying counterfeit salmon in a rigged game of Salmonopoly," continued Staniford. "It comes as no surprise to see the European Commission's antitrust investigators raiding Norwegian-owned salmon farming companies in Scotland as part of a probe into alleged illegal cartels and price-fixing." Scottish Salmon Watch's investigation was prompted by a recipe in Scottish Field magazine in November 2018 which asked: "What Could Be More Scottish Than Whisky-Infused Salmon?" Nothing could be further from the truth, however. The recipe for Scottish salmon (and whisky for that matter) is almost completely foreign. "Decades of foreign incursion have turned the Scotch whisky industry into a fiefdom of the major conglomerates," reported The Herald in 2009 in an article "Who Owns Our Whisky?". Forbes reported in 2016 that less than a quarter of Scotch whisky distilleries were owned by Scottish companies. The Daily Record reported in 2016 that "just 29 out of the 118 production plants are owned north of the Border". So if foreign ownership of Scotch whisky is less than 25% how much of the Scottish salmon farming industry is owned by Scottish companies? The answer lies buried on p31 of the 'Scottish Fish Farm Production Survey 2017' published by the Scottish Government in October 2018. Shockingly, it turns out that all six companies are controlled by foreign investors. In other words, just 1% of Scottish farmed salmon is actually Scottish-controlled! The Norwegian multinationals Mowi (controlled by Norway's richest man and Cyprus tax exile John Fredriksen), Scottish Sea Farms (a subsidiary of Norwegian-owned Norskott Havbruk AS which is jointly owned by SalMar and Leroy) and Grieg Seafood together control ca. two-thirds (65%) of 'Scottish' salmon farming production. Swiss-owned The Scottish Salmon Company (16%), Canadian-owned Cooke Aquaculture (15%) and US-owned Loch Duart (3%) control the other third (with Scottish-owned Wester Ross Fisheries controlling the other 1%). That means well over 200 of Scotland's 226 salmon farms are not Scottish at all despite the Scottish-sounding names of Scottish Sea Farms and The Scottish Salmon Company (registered to the Swiss Stock Exchange but believed to be controlled by Ukrainian businessman Yuriy Lopatynskyy whose most genuine claim to Scottishness is being a neighbour of the First Minister of Scotland in Charlotte Square in Edinburgh). Even Loch Duart - believed by many to be Scottish with shareholders including Scottish Enterprise - is actually controlled by US-based Canadian businessman and Hollywood producer Jeff Skoll. "There is great irony in the fact that Norwegian firms are marketing Scottish salmon by telling the story of our pristine waters, whilst polluting those now not so pristine waters," wrote Sara Nason of Sea Change Wester Ross in a message to MSPs last month. The Scottish Salmon Company is registered to an anonymous bank account housed by the Swiss Stock Exchange believed to be controlled by secretive Ukrainian banker Yuriy Lopatynskyy. Scottish Sea Farms is 50% owned by the Norwegian companies Leroy and SalMar (the latter controlled by the world's youngest male billionaire, Gustav Magnar Witzøe). Mowi (formerly called Marine Harvest) is controlled by Norway's richest man John Fredriksen who lives as a tax exile in Cyprus and is ranked 228th richest man with a fortune of $10.9 billion according to Forbes. Grieg Seafood is Norwegian-owned and registered on the Norwegian stock exchange. Cooke Aquaculture is Canadian-owned with investment from Norwegian and Icelandic banks. Loch Duart's largest shareholder is Canadian businessman and Hollywood film producer Jeff Skoll (executive producer of 'Roma' - nominated for 10 Academy Awards). Today (24 February 2019), Scottish Salmon Watch launched a new campaign - 'Scottish Scamon' - with a documentary film coming out later in 2019.